These are not your daughter’s paper dolls. These are better. Paper fairy dolls, sculpted using either papier mâché (French for “chewed paper”) or Japanese paper-clay (a mixture of boiled water and paper mixed with clay), are meant for collection, not for child’s play. Most of the fairy dolls we’ve found using these techniques have mixed-media additions. Gold paint antiquing, glass glitter, vintage buttons, beads, even a cupcake liner. 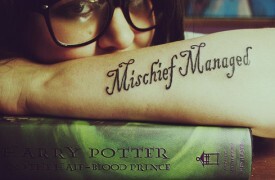 This is art. 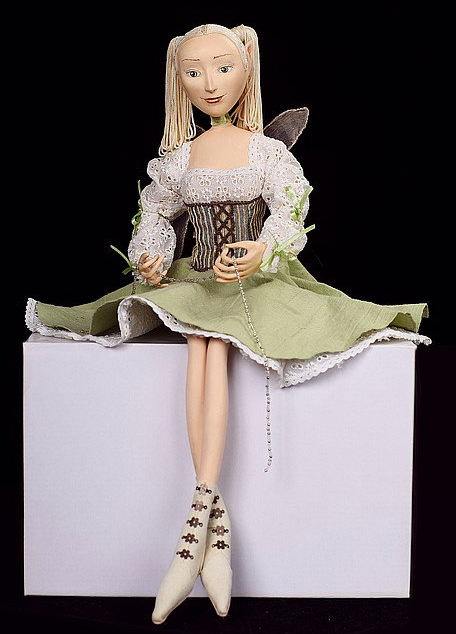 Miller Campbell combines both techniques for this ornamental fairy doll, named Fern by the artist (pictured above left). Made in an Appalachian folk-art style, she stands 8.5″ tall with a wingspan of 6.5″, and can be free standing, or employed as a tree topper. 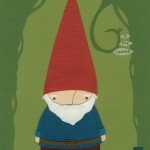 Fern comes signed, named & dated with a Certificate of Authenticity. 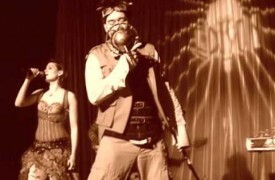 Kaerie Faerie names the paper fairy doll on the right Devon. 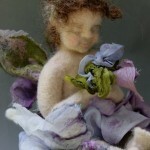 Created using the Japanese paper-clay technique, this beautiful fairy doll now sits on some lucky collector’s shelf with her 15” wing span, hand-dyed hair, and delicately crafted and embellished garment. 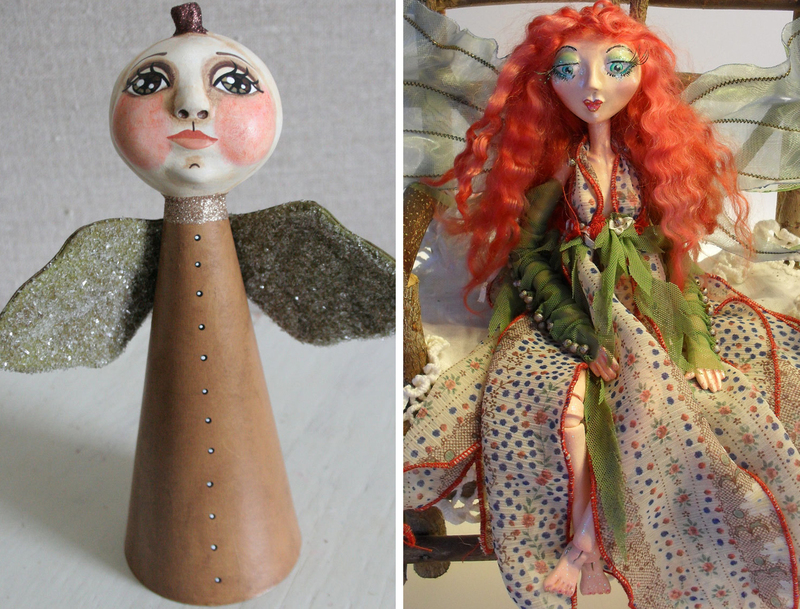 Russian doll-maker Nataliya Platova has created this stunning fairy (at right) meant for the serious collector. There isn’t much information posted about the doll, but we can’t stop looking at her. Nevertheless, the artist gives solid recommendations for lighting and climate control. 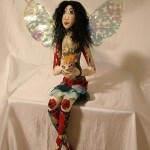 Plum Puppets creates exquisite little fairies in papier mâché using tissue papers to give them a delicate quality. 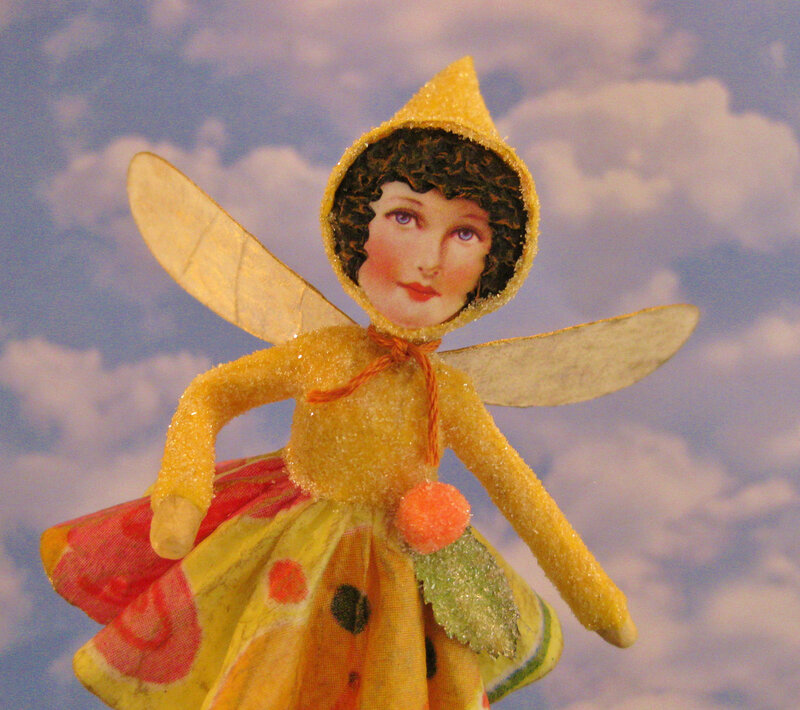 Each unique fairy has a vintage-style face, like this “Yellow Gumdrop Monique” fairy, featured below with the orange pom-pom at her waist. 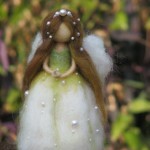 Each of Plum Puppets fairies are about 5” tall and hangs on a thread. 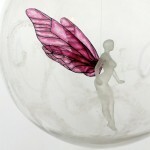 These magical paper sculptures are a small example of endless fairy possibilities… And for grown-ups only. 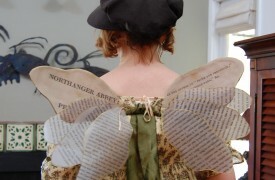 Be sure to see part two in this feature on fairy paper dolls.